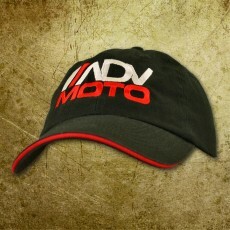 The ADVMoto Red Sandwich Bill Baseball Hat is a simple but attractive design with the ADVMoto logo on front, URL over the back loop with a red-accented locking style back adjuster. With unstructured front panels and low to mid-profile, this model will comfortably fit a lot of heads and pack into a tankbag fairly easily. Slightly heavier material than the contrast hat, makes it good for year-round use. One size fits all.